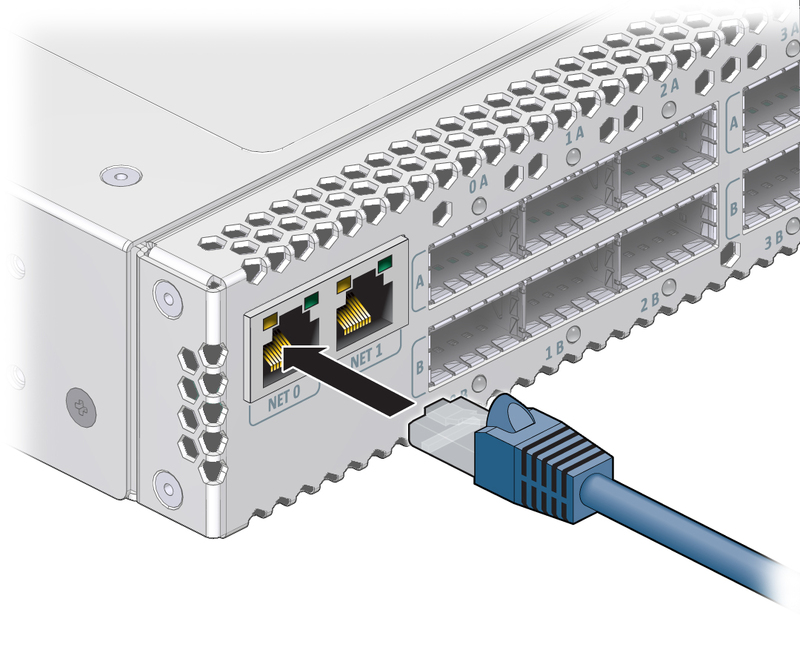 The switch has two connectors for network or serial communication with the management controller. The network management connector, labeled NET, is a 100/100 BASE-T Ethernet interface. 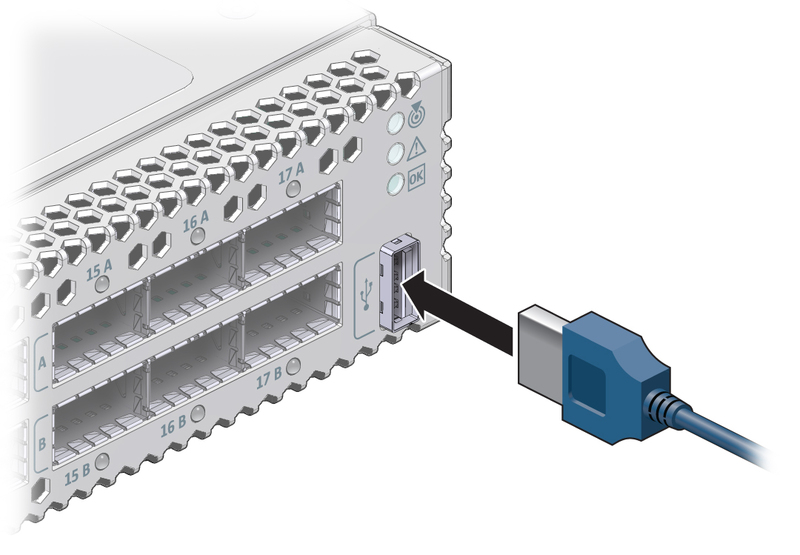 This connector is preferred because it permits remote management of the switch over the Ethernet network. The USB management connector, labeled with the USB symbol, is the second choice for communication with the management controller in the switch. The management console can be a serial terminal, a system running a TIP connection, or other serial device which communicates with the management controller through a USB-to-serial adapter. The serial parameters for communication with the USB-to-serial adapter is typically 115600, 8, N, 1. Connect an Ethernet cable between the switch NET0 port and the network that is configured with a DHCP server. Connections to the management controller are made through DHCP. Use the MAC address of the management controller to provide a host name and IP address for the switch. The MAC address is printed on the customer information (yellow) sheet on the outside of the switch shipping carton and on the pull-out tab on the left front of the switch chassis, adjacent to power supply 0. Note - If a DHCP server is not available, the management controller has a default static IP address of 169.254.0.36 with a subnet mask of 255.255.0.0. Alternatively, you can connect a USB-to-serial adapter cable between the switch’s USB port and a terminal device. This connection provides alternative communication with the management controller. The terminal device must be configured 115200 baud, 8 bit, no parity, 1 stop bit. (Optional) Connect the serial management cables from the management console to the USB-to-serial adapter, and from the adapter to the connector labeled with the USB symbol. Route the management cables so that they do not interfere with other cables, with servicing the switch, or with other systems. Prepare the management console for communication with the management controller. See Attach the Power Cords.